As parents, we are responsible for the "education" of our children. For me, that means simply this: if my daughter, now 7, grows up to be a responsible, self-reliant, self-motivated, honest, caring, freedom-loving good neighbor, and an overall happy person, then I’ve succeeded. I don’t have a career path laid out for her, and I don’t expect her to go to college, even though I have several degrees myself. The choice, when the time comes, will be hers and hers alone. If you are a parent and this sounds like you, you need to pay attention. 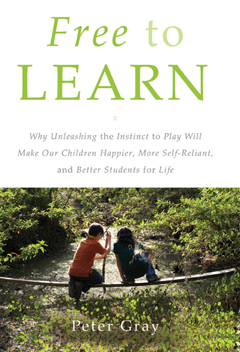 In the recently published book Free to Learn, developmental psychologist Peter Gray argues that if this is truly our goal, "There is no need for forced lessons, lectures, assignments, tests, grades, segregation by age into classrooms, or any of the other trappings of our standard, compulsory system of schooling. All of these, in fact, interfere with children’s natural ways of learning." Using evidence from anthropology, psychology, and history, Gray argues that children come into this world genetically programmed to learn, and that if they are free to pursue their own interests through play, they will learn all they need to know to function in the culture in which they are born, no matter what culture that may be, or at what particular moment in time. Children are designed, by nature, to play and explore on their own, independently of adults. They need freedom to develop; without it they suffer. The drive to play freely is a basic, biological drive. Lack of free play may not kill the physical body, as would lack of food, air, or water, but it kills the spirit and stunts mental growth. Free play is the means by which children learn to make friends, overcome their fears, solve their own problems, and generally take control of their own lives. It is also the primary means by which children practice and acquire the physical and intellectual skills that are essential for success in the culture in which they are growing. Nothing that we do, no amount of toys we buy or "quality time" or special training we give our children, can compensate for the freedom we take away. The things that children learn though their own initiatives, in free play, cannot be taught in other ways. And as Gray points out, it is not only in schools that children have less and less freedom and hardly any time to play. Homework (which is the regime’s way of keeping parents in line, in my opinion) and extra-curricular, resume-building activities now fill our children lives after school, on weekends and all summer long. In all of those adult-directed activities, children are told what to do just about every minute and they are supervised at all times. We have lost the ability to trust children and trusting them is what we need to do. As educator John Holt said, "Nothing could be more simple, or more difficult. Difficult because to trust children we must trust ourselves, and most of us were taught as children that we could not be trusted." We have here a terrible irony. In the name of education, we have increasingly deprived children of the time and freedom they need to educate themselves though their own means. And in the name of safety, we have deprived children of the freedom they need to develop the understanding, courage, and confidence required to face life’s dangers and challenges with equanimity. We are in a crisis that continues to grow more serious with every passing year. We have lost sight of the natural way to raise children. We have, not only in the United States but also throughout the developed world, lost sight of children’s competence. We have created a world in which children must suppress their natural instincts to take charge of their own education, and instead, mindlessly follow paths to nowhere laid out for them by adults. We have created a world that is literally driving many young people crazy and leaving many others unable to develop the confidence and skills required for adult responsibility. Gray also offers solutions. To demonstrate how we can achieve "education" in our modern society without classes, classrooms, curriculums, or testing, Gray uses Sudbury Valley School as a model. SVS, located near Boston, has been in operation since 1968 and currently has around 200 students. Despite the lack of formal instruction, grades, or testing, surveys of graduates show that over 75% of them pursue higher education (with no reported difficulties in being accepted or in succeeding). At SVS, children are allowed the same freedom and rights we have as adults. They are respected as individuals and are allowed to pursue their own interests so long as they do not infringe on the rights of others in the school community. The school, the staff (they are not called "teachers"), the resources are there for the students to use as needed. Each child is 100% free to explore the world in his own way and at his own pace. The school is also self-governing, with each child and staff member having a vote and being allowed to participate in the running of the school, including voting on rules, the allocation of resources (budget), and the hiring (and firing) of staff. Rules infractions are dealt with through a Judicial committee that evaluates, investigates, and ultimately issues sentences if a party is found guilty. In short, students at SVS, and at other Sudbury schools in the US and abroad, are enjoying life, liberty, and the pursuit of happiness, while learning to take responsibility for their actions, education, and lives, and learning to live as members of a democratic society. And it works! At SVS, it has been working for 45 years, but who’s counting? What Gray’s research also confirms, and what many parents have known all along, is that there is nothing wrong with our children. They do not need "fixing" and certainly not with drugs. We, as a society, are making our kids miserable, anxious, depressed, and stressed, drugging some of them so they can get through the day, for no benefit whatsoever. What we are doing to our children through "schools" is not only unnecessary, it is cruel and becoming increasingly dangerous. Childhood is not a disease or a mental disorder. We simply need to stop treating it like one and as parents, we need to learn to trust and respect our children as the human beings that they are. Free to Learn is, in my opinion, the ONE book every parent should read to really understand the nature of human education (how our children learn) and how we can best facilitate our children’s natural instinct to educate themselves. This is where we need to go back to basics, not in math, reading, or sciences. And you’ll find that the answer can ultimately be found in one little word: Freedom.